The world of startups is an incredibly harsh one, with most companies ending up either getting bought or closing down — assuming they even manage to gain any traction in the first place. AppGratis is unfortunately an example of a startup that's recently fallen into the latter category, having just announced its shutdown a few days ago. AppGratis started its life in 2008 as a daily newsletter listing app discounts on the iOS App Store, shifting to a standalone app model two years later in 2010. It ran up against some issues with Apple's application policy in late 2013, which ultimately led to its removal from the App Store and the launch of its Android app the following month. 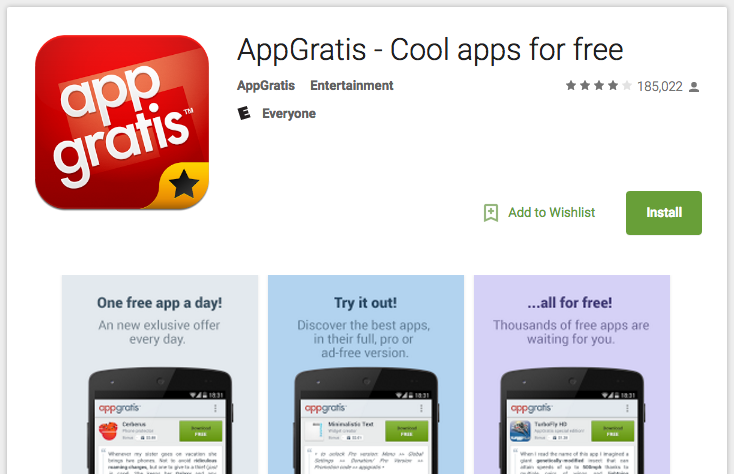 Over the following three and a half years, AppGratis racked up 10 to 50 million downloads on Google Play. Despite providing a valuable service, the fact is that the app's practical use has diminished over time and other apps such as AppSales have begun to take its place. Even recent changes to the way developers can set up sales on the Play Store removes much of the need for an app like AppGratis. One main disadvantage of AppGratis's model was its reliance on coupon codes. Typically, these codes would unlock premium features from within an app's free version, but since most of the time these promotions weren't associated to a Google account, it meant that users would be left with nothing if they uninstalled the app or tried installing it on a new phone. The team behind AppGratis wrote a short piece on their decision to shut down the service, and you can check it out in the source link below.